These vegan, gluten-free, and paleo-friendly Pumpkin Pie Bites are great for a seasonal, healthy treat. 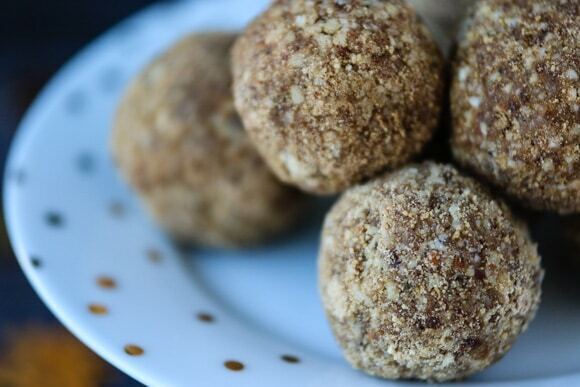 These cookies fall into the category of Energy Bites, meaning that they are a no-bake treat full of energizing ingredients. This Pumpkin Pie Energy Bite recipe is a tweak on my classic Chocolate-Coconut version, but with the addition of pumpkin pie spice for that distinctively yummy pumpkin pie flavor. I’ve actually just updated this recipe to include a dusting of maple sugar on the outside. I’ve updated this recipe with a “how to” video! I’ll be making another batch for a Halloween party this year. I honestly can’t get over making energy bites as a healthy treat to have on hand. Sometimes I make a double batch and freeze one. They only take about 30 minutes of de-frosting time in the fridge. A seasonal, healthy treat that tastes like pumpkin pie! 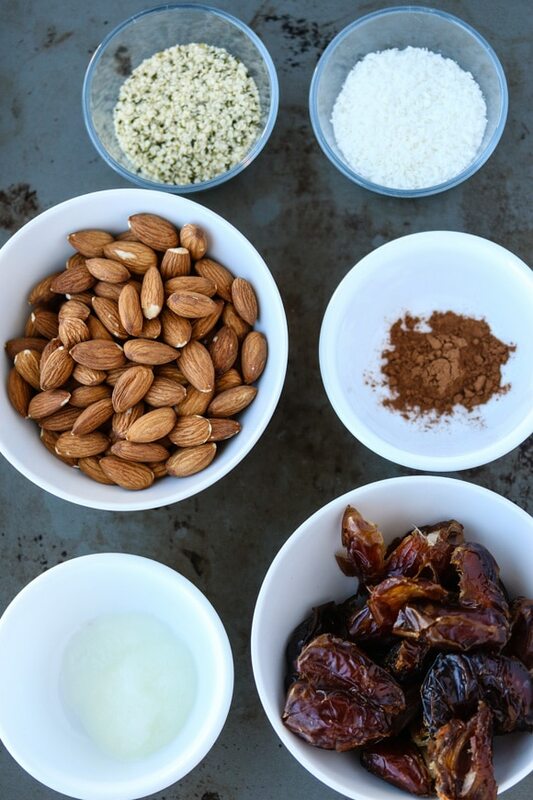 Combine almonds, hemp seeds, coconut, pumpkin pie spice, coconut oil, and dates in the base of a food processor. Turn the processor on high for about 2 minutes. The ingredients should be well combined. Pour the mixture into a mixing bowl and then use your hands to roll the dough into about 12-15 cookies, about 1-1/2” in diameter. To make the pumpkin pie spice dusting, place the maple sugar and pumpkin pie spice onto a plate. Roll each cookie in the sugar until covered. Place the cookies in the fridge for at least 2-3 hours to chill. The cookies can then be served cold or at room temperature. Organic pumpkin pie spice that has a really nice flavor…my favorite one! Be sure to pin this image to save it to your favorite healthy Pinterest board! Get my FREE Energy Bites e-book! Who could resist these little treats. They look delicious and I love anything with dates! I love these types of power balls. I am sure your class is going to love them! I know I would love these but would be afraid to make them for ‘me’ since they would be gone by the end of the day (in me!) But I will make them this week because my almost ten year job cooking for four men who live together is coming to an end. I’ll make these for my guys and I’m sure they’ll love them and I’ll be able to have one or maybe two to try. Hi Judy! You made me smile with your comment about making the cookies for yourself and then eating them all yourself. Wow, it sounds like you have some big changes ahead with your job, although cooking for four men sounds like a BIG job! I hope you have some good opportunities ahead. XO. These little bites sound so tasty and healthy. Sure look like there easy to make too. Would make a wonderful and healthy snack for kids and adults too. Thanks for sharing on Real Food Fridays. Pinned & tweeted! I had to look up pumpkin pie spice ingredients and almost forgot it’s a blend of 4 or 5 spices (found a DIY recipe in The Old Farmer’s Almanac). I think I’ve subbed allspice in a pinch when it’s a tiny amount. I love cocoa powder so that is not an option, it’s mandatory for the chocolate fix. Thanks for the recipe. You’re so welcome, Deb!!! I love that you made your own version of pumpkin pie spice. Yum! These little bites are adorable! And as someone who doesn’t tolerate pumpkin well, I was quite excited to see there is no actual pumpkin in them – just the spice flavouring. These would be perfect for any halloween get together. Hi Kimmy!!! That’s interesting about not tolerating pumpkin well. I’m kind of the same way with sweet potatoes. I just read your post about loving Halloween…I guess we must be opposites in that way. I did love Halloween when I was younger, but only for the candy part, not the dressing up part. 🙂 XOXOXOXO. Yum! Definitely will have to make these! Awesome, Tammy. Let me know how they turn out for you! XO. Yum! Perfect for the fall season! Awesome that it’s vegan too for my vegan buddies! So yummy! 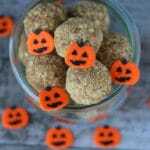 Such a great recipe for a healthy halloween treat! As a pumpkin lover, this looks fantastic! Such a great Fall treat. Oh yum! These are so fun! I love everything pumpkin pie this time of the year … I bet the texture is awesome with those dates in there too. Yum! Mmmm, so yummy! Love that maple sugar you use for dusting; and is there anything yummier than dates?! Such a fun fall treat! 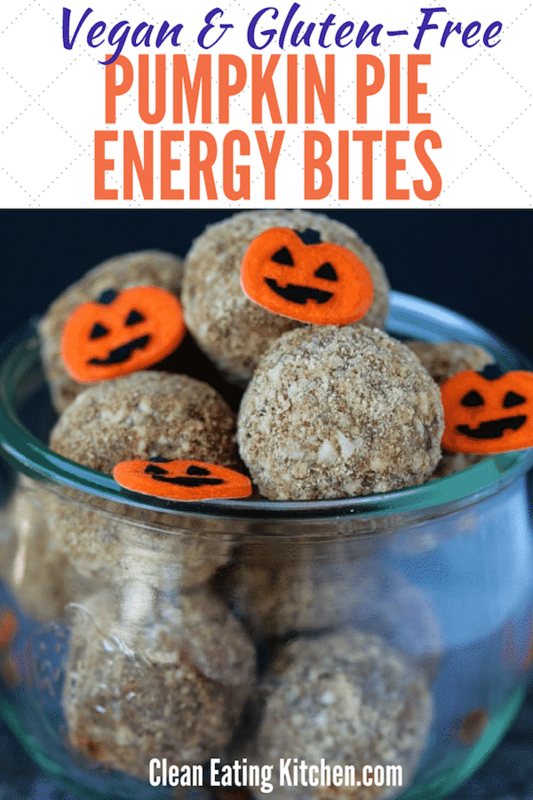 I love energy bites, they’re just the perfect healthy snack! Thanks, Donna! That’s interesting that you call it gingerbread spice. We have gingerbread spiced-treats too, but they always include molasses flavor. 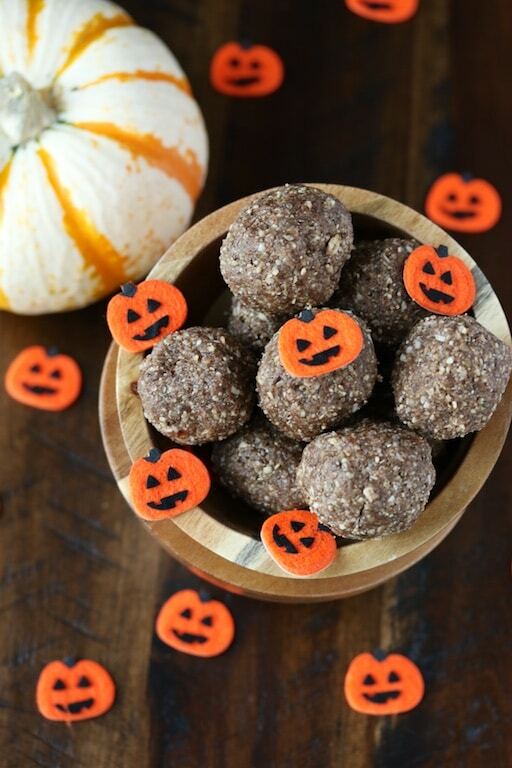 Love these pumpkin vegan bites. so cute and delicious ! These are PERFECT for this time of year. YUM!! Perfect bite sized treats!! Yum!!! 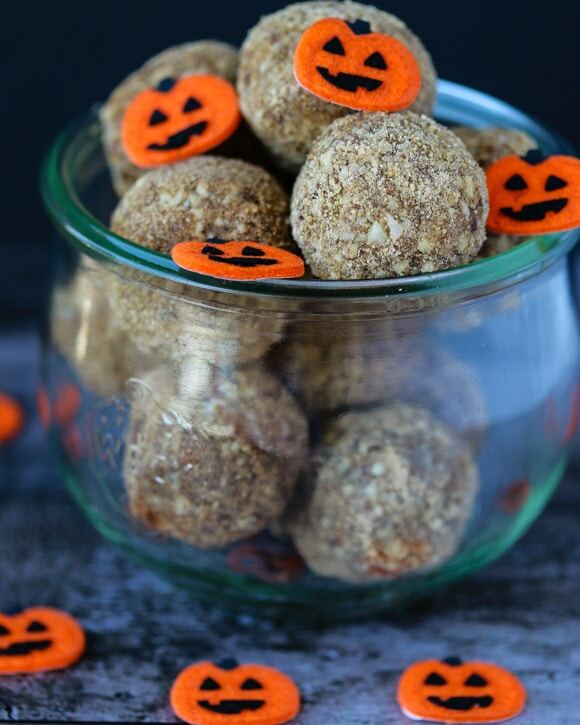 What a great way to give a healthy Halloween treat! I love energy balls like this..
Mmmm! Love that you included hemp seeds! They’re one of my favorite vegan protein sources! Wow I’m always mesmerised by your recipe ideas! Love these energy bites, thanks! Oh wow these look great and so easy to make! These sound wonderful! I love a grab and go treat! Yummo! 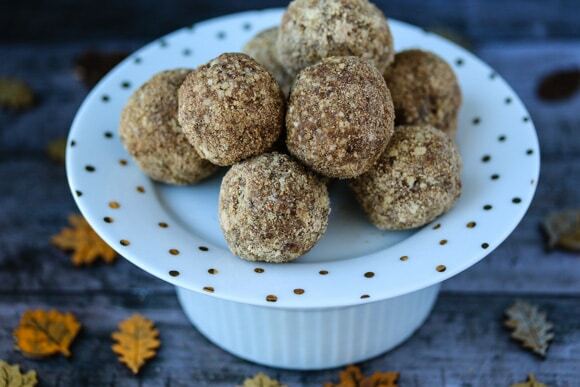 I love a good energy ball recipe and anything with pumpkin pie spice gets a huge thumbs up! Love these little bites. So healthy. Yum! I’m totally going to make these for my kiddos!